Frequently, José Raventós is the inventor of the famous Spanish sparkling wine named in Sant Sadurni d'Anoia in today's DO Penedès in 1872 supposedly first produced such a. The honor is actually due to others. For already around 1850 Antoni Gali Comas made a sparkling wine. Other achievements acquired Luis Justo y Villanueva (1834-1880), the Labor Director of the Agricultural Institute in Sant Isidre, the some producers Champagne method taught. In 1872, sparkling wines were presented by three of his students at a competition in Barcelona. However, the fact is that José Raventós is the head of today's huge Cava house Codorníu First, the sparkling wine from today's standard varieties Parellada. Xarello and Macabeo but did not market it until 1879. At that time the sparkling wine was named after its "big brother" ( champagne ) simply called Xampàn (or Castilian Champána). When then the (then 1986) EU accession of Spain became apparent, one had to search for legal reasons for a new name and the result was as follows. In Spain one differentiates between Cava and Bodega, but both means Kellerei. But while the bodega is a simple, ground-level building, you put a cava underground. Sparkling wine is now maturing under cool temperatures during yeast storage and the winemakers have long been calling their above-ground products Bodega wines and the underground sparkling wines Cava. Much more difficult was the EU demand for the controlled ancestry one quality wine, So Spain had to define the areas. The main criterion was whether the communities concerned had a sparkling wine tradition. In the opinion of critics was not necessarily the quality in the foreground. The result was in 1992. A total of 159 municipalities were established, most of them in Catalonia are located. However, a number of them are also scattered to some extent in still vineyards such as for example Ampurdán-Costa Brava. Calatayud. Campo de Borja. cariñena. Costers del Segre. Navarra. Ribera del Guadiana. Rioja. Tarragona and Requena, Around 90% of the Cavas come from the Catalonia region and 75% from Penedès. The supra-regional area covers about 32,000 hectares of vineyards. No area or municipality name may appear on the bottle label, only "Denominación Cava" is allowed. Therefore, Cava is actually not a DO (Denominación de Origen), since it is indeed not a denomination of origin (Origen = origin), but a definition of quality. The DO Penedès applies only to still wines. The remaining sparkling wines (which may not be called cava) are called "Fermentació en ampolla" or "Fermentación en botella" (mutatis mutandis bottle fermentation ) designated. For white cavas are the varieties Parellada, Xarel • Lo ( Xarello ), Viura ( Macabeo ), Subirat ( alarije ) Chardonnay and since May 2007 too Pinot Noir, as well as for Rosados Monastrell and Garnacha Tinta authorized. 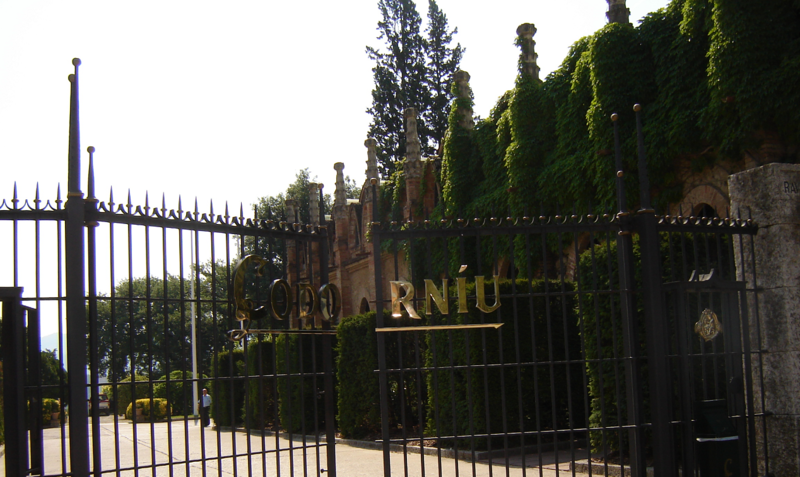 Codorníu sat in the early 1990s against the vehement resistance of its major competitor Freixenet by the approval of the Chardonnay variety. The production must necessarily after the Metodo tradicíonal, that means bottle fermentation respectively. A cava has to mature on the yeast for nine months (analogously Crianza ) and may come into the trade at the earliest one year after the harvest. After 15 months of maturation, they are considered " Reserva ", After 30 months as" Gran Reserva ". In 2017, Cava de Paraje Calificado was introduced as the highest level of cava with particularly strict rules. These include small classified parcel, max. Yield 8,000 kg / ha, vintage cava, yeast storage 36 months, only until brood, no rosado. The sweetness levels comply with the EU rules for sparkling wine, The authenticity of a cava is attested by a branded star in the cork. The other sparkling wines (which can not be called cava) are "Fermentación en Botella" (fermented for two months in bottle, after defoliation bottled again, cork with rectangle), "Grandes-Envases" (tank fermentation, cork with circle) and the sparkling wine "Vino Gasificado" (carbonated wine, cork with triangle). Well-known producers are Albet i Noya, Castellblanch, Castell d'Age, Castillo Perelada, Codorníu. Freixenet. Jané Ventura, Jaume Serra, Marqués de Monistrol, Masia Bach, Torres, Parxet, Pere Ventura, Pinord. raimat. Segura Viudas, Torelló, Vallformosa, In 2015, a total of 244 million bottles were marketed worldwide, with only around a third consumed in their own country. This page was last modified at 5 April 2019 at 16:27.